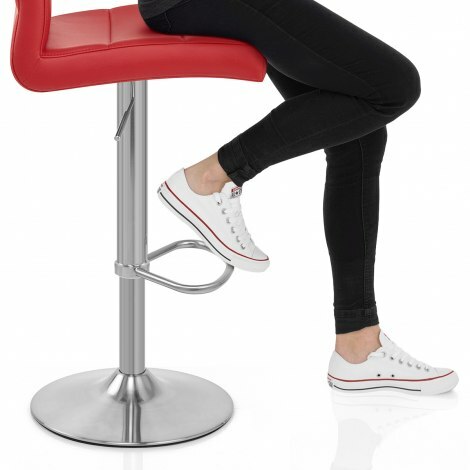 The striking Brushed Steel Breakfast Bar Stool Red fuses classic style with contemporary ergonomic design. Delivering a bold and beautiful appearance to your kitchen bar area, the Brushed Steel Breakfast Bar Stool is set to make a striking statement. Tall and slightly curved, the supportive backrest is cushioned for exceptional comfort. The seat is also padded, and both are covered with vivid red faux leather for an eye-catching aesthetic. Horizontal stitching on the backrest and seat adds visual interest without complicating the beautifully simple look of this model. 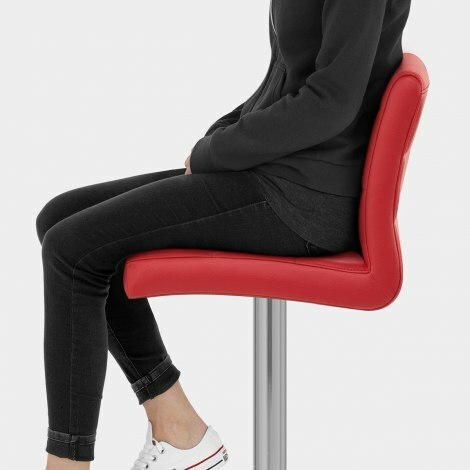 Plus, for fantastic functionality, a gas-lift mechanism is incorporated into the hand-brushed frame, enabling easy adjustment of the seat height as well as 360-degree swivel movement. The round base of the Breakfast Bar Stool comes complete with a rubber floor guard to help to keep your floors in great condition. I was able to go to the warehouse to see and try out an extensive range of bar stools. I later made my choice and ordered on-line and took delivery the following day. Self assembly reasonably straight forward. Great product.